St. Patrick was born into a Christian family in Britain. As part of the Roman empire, Britain had been Christianized long before, but no one had successfully brought Christianity to Ireland. Patrick's family was actually quite involved in the Church -- his father was a deacon. Patrick was a rebellious lad who was captured by some sailors and sold into slavery in pagan Ireland. This all comes from his writings which are still available today. And Why Is He So Beloved? Today is St. Patrick's Day. People keep telling me about drinking green beer and being pinched for not wearing green. This seems like a silly, even if fun, way to celebrate the feast day of the man who brought Christianity to Ireland. No, St. Patrick was not the first missionary to try to convert the Irish. He wasn't even Irish by birth. He was born a Roman citizen in Britain, son of Calpornius, who was a deacon, and grandson of Potitus, who was a presbyter, or priest. His date of birth is uncertain -- somewhere between 385 and 415 AD. His mission in Ireland lasted about thirty years after which he died. The exact dates and details are uncertain, as are many of the legendary claims about his life. For example, though St. Patrick has long been credited with freeing Ireland from snakes, it is unlikely there ever were any snakes in Ireland. However, those who created such stories could have been speaking in metaphorical language. What does exist are at least two texts that scholars affirm are really written by St. Patrick's hand. These texts are his Confessions and a Letter to the Soldiers of Coroticus, who had slaughtered some of Patrick's newly baptized followers. Both of these texts were written in Latin but have been translated into English. According to Patrick's own account, when he was not yet sixteen, he was captured as a slave along with thousands of others. Despite the religious background he had come from, Patrick wrote that he "was ignorant of the true God," and felt that he deserved his fate because he had cut himself off from God and was a bit of a rebel. Yet somehow in his captivity, Patrick opened his eyes to himself and to his relationship with God. He turned to God and felt that throughout all of his experiences as a slave, alone and lonely amidst strangers, he was watched over and protected and that God comforted and strengthened him "as a father consoles a son." It was through Patrick's experience of his own weakness and his humility of being able to really look at himself that made him more attuned and sensitive to God's presence all around him, in nature and in other people. This is what gives the prayer attributed to him, called "St. Patrick's Breastplate," such power and such beauty. 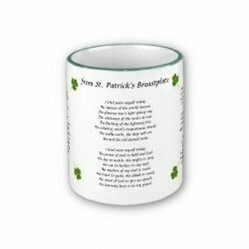 Have you ever read the writings of St. Patrick? Patrick's account of his escape from Ireland as a slave is filled with what he saw as miraculous events: things just seemed to line up for him and what seemed impossible became not only possible but inevitable. In reading it, though, it seems to me that he had to act with a great deal of courage and trust. After finding his way to France, Patrick, whose youth had been consumed in slavery, watching over the sheep of his master, found himself at a disadvantage as far as his education was concerned. He never felt he was able to catch up with his peers, though he did eventually become a priest. He had a dream in which he heard the Irish people calling him back to Ireland, so that when the Pope wanted to send yet another missionary to Ireland, Patrick volunteered. At first, he was dismissed as backward and unsuitable, but because he could speak the language and because it was not a position others really cared to fill, he was anointed a bishop and sent. Because Patrick understood the people and could speak their language, having lived with them so long, he found a way to reach their hearts. He converted them with love as well as with eloquent words. Although in some ways, Patrick could be said to be mystical, his is an earthy faith, simple and direct. That is probably why he was successful in bringing Christianity to Ireland where others were not. St. Patrick is Ireland's patron saint and favorite hero. St. Patrick's Breastplate, the famous prayer attributed to St. Patrick, speaks of the Celtic connection to all Creation. Who is St. Patrick? Discover more about Ireland's favorite saint. So then, here are my St. Patrick's Day meditations. So few people really stop to think who St. Patrick really was, and so many conjectures and associations are made about him that are harmless in a sense, but that in reality trivialize him and undermine the depth of his message to the people of his time and to us today, as well. I hope you have learned a couple of things about St. Patrick, often called the Apostle to Ireland. His message is not just to those of Irish descent, but those of us who do have Irish roots hold him in a special place in our hearts.